Recently, I asked my readers -- all mothers -- to share with me who they are in the margins of motherhood. I'm a cook, sometimes a caterer, sometimes a borderline chef. I'm an "I'd rather make it than buy it" rebel inspired by Pinterest. I'm a color selection specialist for friends who are afraid to paint anything other than beige/ taupe/ creme. I'm a counselor for friends when it feels like something is about to break. I'm an instigator." I am a former zookeeper. And now I'm an aspiring vegan. I am a daydreamer and a dabbler - cooking and photography and even painting are fun to play around with. I am also a musician. I play flute but haven't in months because my toddler isn't a huge fan of it! I'm an appreciator of simple things. I'm a woman who's pretty happy being my nerdy introvert self. But, there were others who didn't respond with such enthusiasm. I am not sure about anything about myself anymore. I don't have time to focus on myself or my dreams. And, here's what I told them in response. You've just lost the ability to focus on yourself 100 percent like you used to be able to do before other things -- children, jobs, life -- became so demanding. You've just grown up. You're not that little girl sitting on the wall dangling her feet daydreaming the day away anymore. You're spinning. You're faced with worries. You're full of fear. You're caring about everyone else but yourself. In fact, at the end of the day, you can't think of more than one thing you did just for yourself. If we're not careful, we'll lose our sparkle during all that care taking and worrying and fearing of making mistakes. And, when we live in that "less than" state of mind, we're not happy, which means we're not at peace. And when we aren't feeling at peace with ourselves or our life, there's a very good chance our children aren't feeling at peace either. The only way to get back to yourself -- or to find the new you -- is to start where you are right now. That might be doing the dishes. Or scanning Facebook, again. You might not have time for anything extra in the margins of motherhood just yet. But, if you really want that sparkle back, you have to work for it. You have to find the time. You have to carve out the space. You have to make YOU a top priority. Time has to become your friend not your enemy. Use every single precious moment to your advantage to create a feeling of peace and being enough. That's when you'll start to see the abundance in your life. For now, though, please know that the real YOU is still inside that body that feels so overwhelmed with parenting and working and housekeeping. Your dreams are alive and shining inside of you. And your time will come, and it will probably be very soon. Shawn Fink is the author of The Playful Family and the Thinking Mama behind Awesomely Awake, a blog encouraging families to find their happy place. She is a peace and kindness spreader and offers various e-courses, including The Abundant Mama Project that guides mamas in creating their own daily gratitude practice. You can follow Shawn on her Blog or find her on Pinterest, Facebook and Twitter. The Abundant Mama Project is a 5-week e-course experience that guides you through a self-discovery journey to figure out who you are now that you are a mother and what really is the most important things in your life. For five weeks, we take self-care time to do journaling prompts, real-life gratitude challenges and connect with a wonderful, supportive tribe of like-minded Mamas around the world who share the same stories of struggle, transformation and triumph. 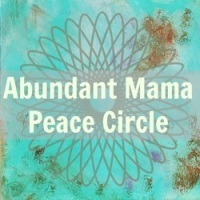 And now, you can also join the Abundant Mama Peace Circle, which extends the course in a weekly e-mail for the rest of 2013. Quick note from Liz: I'm an affiliate for Shawn's Abundant Mama ecourse and Peace Circle because I really think they are going to be fantastic and a beautiful opportunity to connect with other mamas.